First and foremost, our clients mean everything to us! The decision to close Saturdays in October was difficult because we understand the need for our services but we are also committed to providing the best service possible and in order to do this, we need to consider our own health. Christen is wonderful and helpful for everyone but she has 2 little ones to care for; I have been working 6 days a week for the most part since March and I am tired. With winter coming on and the abundance of breast cancer events that we are involved with in October, we feel it difficult to stretch ourselves so thin that we could get sick and THAT, we can’t afford. We need to protect you, our clients. We hope to return to normal Saturday hours in November and hopefully will find a new part-time person to help us out. We apologize for the inconvenience this may cause. Kelly, even at her young age, was one of the bravest and proudest women I had the honor of knowing. Kelly: my sister-in-law, my youngest brother’s wife, my niece Caroline’s mother; was diagnosed with inoperable inflammatory carcinoma in November 2002. She had aggressive chemo treatment until May 2003 when she underwent a double mastectomy then continued aggressive chemo and radiation therapies until sadly, she lost her battle February 20, 2005. Her courage, strength and faith overwhelmed, touched and taught many along her journey. She would often say, “you take what is handed to you and you do with it all you can”. Today, her spirit lives on in the hearts of family and friends; from her portrait, she watches over all who visit the boutique. Kelly’s diagnosis prompted me to fulfill a long-time interest to work with women with mastectomies. 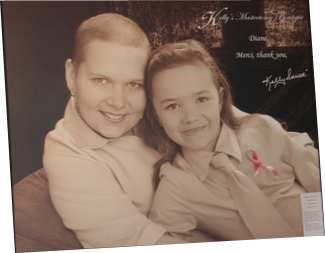 In June 2003, with Kelly’s blessing, the boutique became her namesake and Kelly’s Mastectomy Boutique opened its doors. A constantly growing clientele permitted me to open one of the largest mastectomy stores in the country, to create pleasant and comfortable surroundings for clients and make available a larger selection and variety of mastectomy garments and products. Every day, I have the distinct pleasure of meeting the bravest, strongest, most beautiful and incredible women… my clients. La boutique porte fièrement le nom de ma belle-sœur, l’épouse du plus jeune de mes frères, la mère de ma nièce Caroline; Kelly, diagnostiquée en novembre 2002, subi de nombreux traitements chimiothérapie and radiothérapie ainsi qu’une ablation bilatérale. Kelly est succombée de son cancer du sein en février 2005, mais son esprit sourit toujours sur sa famille et ses amies. Sa photo règne et veille sur la boutique et celles qui nous visites. Since opening the store with a huge focus on mastectomy/lumpectomy related products, I have truly enjoyed working with clients who are the most spirited, strongest, bravest and most inspiring women I would ever want to meet.